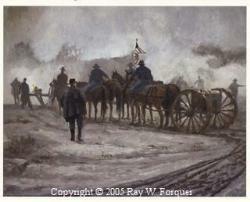 Ray Forquer is recognized for the popular appeal and historical accuracy of his work. During the past 35 years, Forquer has received praise from critics for his ability to combine glimpses of history with his native Western Pennsylvania landscapes. His landscape paintings, historical works, portraits and limited edition prints are included in an ever-growning number of corporate and private collections. 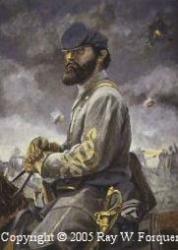 Several of his paintings have been chosen to illustrate historical books dealing with the Civil War, the Whiskey Rebellion of 1794 and decisions in the Presidency of George Washington. His paintings have also appeared in several national magazines, newspaper articles and television documentaries. 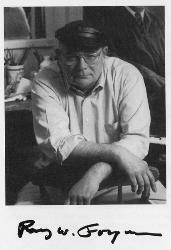 Forquer's original works have won many awards and have been included in numerous Washington and Jefferson College National Painting Shows; at the Chatauqua Art Association Gallery at Chatauqua New York; at the Westmoreland Museum of Art in Greensburg, Pa; at the Stifel Gallery of Oglebay Institute, Wheeling West Virginia; the Three Rivers Arts Festival, Pittsburgh, Pa.; the Butler Institute of American Art and in many private college & university exhibits. The artist is a member of the Associated Artists of Pittsburgh, the Pittsburgh Society of Artists, and the South Hills Art League.